1998 Amada “VIPROS 255” mdl. VIPROS205050 20 Ton 31-Station CNC Turret Punch Press s/n AVP55160 w/ Fanuc Series 18-P Controls, 31-Station Turret, (3) Indexable Tool Positions, Automatic Sheet Repositioner, Brush-Top Table, SBC mdl. EX3.0 Cooling Unit, 1999 Amada MP1225NJ 2-Shuttle Automatic Loading System s/n 12254049 w/ Amada Controls, Vacuum Sheet Lift, Hydraulic Scissor Platform Life, Brush-Top Table. 1999 Amada MP1225NJ 2-Shuttle Automatic Loading System s/n 12254091 w/ Amada Controls, Vacuum Sheet Lift, Hydraulic Scissor Platform Life, Brush-Top Table. Minster “6” 60 Ton OBI Flywheel Type Stamping Press s/n 6-55-25105 w/ Minster Controls, Pneumatic Clutch, 4” Stroke, 2.75” Ram Adj., 90-180 Strokes/Min, 16” Shut Height, 21” x 32” Bolster Area, STI Optisafe Light Curtain. Kitamura MyCenter HX400 4-Axis 2-Pallet CNC Horizontal Machining Center s/n 42448 w/ Fanuc Series 16i-M Controls, 50-Station ATC, CAT-40 Taper Spindle, 4th Axis Thru Pallets, 15 ¾” x 15 ¾” Pallets, Turbo Chip Conveyor, High Flow Coolant System. Makino A55 4-Axis 2-Pallet CNC Horizontal Machining Center s/n A91-126 w/ Fanuc Series 0-M Controls, 100-Station ATC, CAT-40 Taper Spindle, 4th Axis Thru Pallets, 15 ¾” x 15 ¾” Pallets, Oilmatic Oil Cooler, High Flow Coolant System. Supermax YCM-FV56A 2-Pallet CNC Vertical Machining Center s/n 102224 w/ Fanuc Series 18-M Controls, 20-Station ATC, CAT-40 Taper Spindle, Hand Wheel, 16” x 22” Pallets, Coolant. 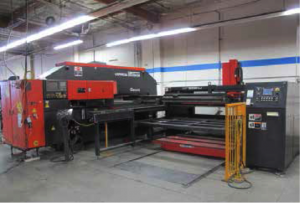 Supermax YCM-FV56A 2-Pallet CNC Vertical Machining Center s/n 101223 w/ Fanuc Series 18-M Controls, 20-Station ATC, CAT-40 Taper Spindle, Hand Wheel, 16” x 22” Pallets, Coolant. 1996 Fadal VMC4020HT CNC Vertical Machining Center s/n 9604422 w/ Fadal CNC 88HS Controls, 21-Station ATC, CAT-40 Taper Spindle, 10,000 RPM, 20” x 48” Table, Coolant. Flow Type 4X2M WMC 2-Head CNC Waterjet Contour Machine s/n 222008 w/ Flow Controls, 65,000 PSI Pump, Morflo Garnet Hopper, 8’ x 13’ Table. Brobo “Super 300” Miter Cold Saw w/ Pneumatic Clamping, 2-Speeds, Stand. Mitutoyo “Bright-M” mdl. BRT-M710 CMM Machine s/n BC0001112 w/ X=28”, Y=40”, Z=24” Work Envelope, Renishaw MH20 Probe Head, 43 ½” x 64” Granite Table, GEOMeasure Software and Computer. (3) Kurt 4-Position 6” Double-Lock Vise Tombstones w/ 15 ¾” x 15 ¾” Bases. (3) 4’ x 8’ Down-Draft Tables w/ 1/2Hp Blowers.